to see. Where should you go? How about Turks and Caicos? Forty islands and cays south of the Bahamas with sugar white sand, turquoise waters, andaneversoslighttradewindbreeze. 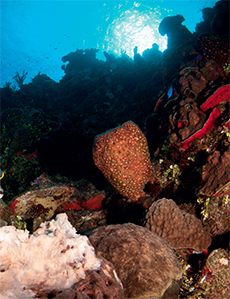 Underwater - sheer walls covered in corals and sponges leading straight down into the deep abyss with great visibility and abundant marine life. Turks and Caicos, a British Overseas Territory, is about 900km south of Miami. With a direct flight from LHR on British Airways each Sunday (or any day with a stop in Miami) you can be sipping a rum punch on the beach in just twelve hours, and have your kit set up and ready to dive the next morning. Having world class wall dives, the deep channels between the T&C islands bring in pelagics and there’s a chance to see hammerhead sharks, tiger sharks, loggerhead turtles, and maybe even a whale shark if you’re lucky. 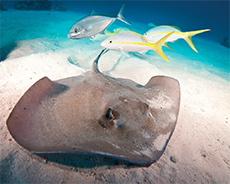 Eagle rays and mantas cruise the deep wall drop-offs. 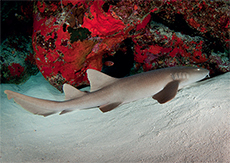 Caribbean grey reef sharks and nurse sharks and hawksbill turtles are common on most dives. 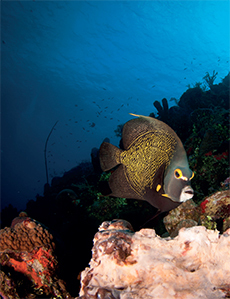 From December to about April lucky divers may see a humpback whale making its transit to or from the Dominican Republic’s Silver Bank to mate or give birth to their yearly calves. Dive centres, beach resorts, and island-style bars abound, but the best way to get in the most diving and explore as much of T&C as possible is done on a liveaboard dive boat. Up to five dives a day (and the option to skip a dive or two and relax on the top deck soaking up the sun) your private yacht for the week will take you to all the best locations, greet you with warm towels after each dive, all while trying to stuff you with their delicious cuisine during every moment you are on the boat. Eat, sleep, and dive, they say. Sounds awful, right? Where do I sign up? The Turks and Caicos Aggressor II departs Providenciales, or “Provo,” each Saturday for a week-long trip and up to 27 dives. Starting off on the North Point of Provo, the 36 metre yacht outfitted for 18 passengers moors directly to each dive site allowing for easy access. Simply get into your kit (which spends the week at your designated spot with private locker and places to hang your wetsuit on the dive deck) and jump into the water. Weather permitting the boat will also visit West Caicos and French Cay. Our first dive site at North Point was Black Coral Forest. The stern of the boat sat just off the edge of the wall, so after our giant strides, we descended down to about 12m and the edge of the wall. 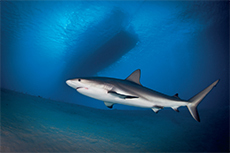 Looking down into the deep blue, three grey reef sharks cruised the wall below us. The wall itself was covered in corals, gorgonians, and sponges of purples, yellows and oranges. Not one bit of it was bare, but covered in life and reef fish, that have orientated themselves to swim sideways on the sheer wall. as I was checking out the macro critters when my dive buddy tapped me on the shoulder, a hawksbill turtle was swimming straight towards us. We watched as it seemed to see us in its way and adjust to swim directly over us and continue its journey. to mermaids for breaths of air; however no one told the contestants the importance of exhaling while ascending leading to some cases of embolism and the demise of the show. Now this site has become a fantastic artificial wreck housing hundreds of blennies that have made their homes in the rusting metal. There were also several white tip sharks, schools of French grunts and many other reef fish. We did a night dive here and we found long horned nudibranchs, cowries with their mantles out, and the white tip sharks out hunting. Back on board we didn’t even have our wetsuits off before the crew was offering us hot chocolate. white clouds the boat had moved to our next dive site, Rock Garden Interlude, on West Caicos, before most of us got out of bed. The crew told us about a special fish that lives around this site, Bob, a very large and friendly Nassau grouper that likes to come up to divers for a scratch under his chin. Sure enough, about ten minutes into the dive we were swimming along the wall and this large fish bolted right up to our dive guide and stuck its chin by her hand. She gave him a scratch under the chin and then rubbed him from his nose to his back and motioned us to come in one by one to have a turn. When we all had a go we continued the dive, swimming away from Bob and he followed us the rest of the dive. huge barrel sponges. Every few minutes a shark swam by, and on closer examination of the wall much macro life was seen including arrow crabs and decorator crabs. out to aerate them and keep them clean. us around like puppy dogs waiting for a late night snack. With our good weather luck continuing, the seas stayed calm as glass and the crew took the boat a bit further south from French Cay to a dive site at West Sand Spit. Another uninhabited cay, this tiny bit of sand has a beautiful dive. Rarely visited, the coral, sponges, and sea fans have grown to massive sizes, and in the sandy channel leading to the wall there were huge rough tail stingrays. stingrays moved along next to us feeding in the sand and seagrass. Swimming down to the edge of the wall, we discovered why this site is so named; several giant elephant ear sponges lined the wall. Heading back to the boat a large barracuda was watching us from the swim ladder, but he politely moved further forward to the bow as we came closer. in the sand. Swimming over the wall one more time felt like flying, as one second there was coral and sand below and once over the wall, nothing but blue. An eagle ray met us, swimming in the opposite direction and passed our group just as our air was getting low and it was time to return to the boat, and soon return home and back to the cold and busy work schedules. A fantastic week of diving in Turks and Caicos was over and it did not disappoint. We saw big stuff and little stuff and all while enjoying water temperatures around 25C (the temperature ranges 23-26C in the winter and 27-29C in the summer). The Aggressor kept us well fed, in comfy beds and well taken care of by a fantastic crew making sure our every need was met. I can’t wait until it’s time for another holiday and I can leave the drysuit behind and head back to T&C.